ART CARNEY in "Harry and Tonto", Albert Finney in "Murder on the Orient Express", Dustin Hoffman in "Lenny", Jack Nicholson in "Chinatown", Al Pacino in "The Godfather, Part II"
ELLEN BURSTYN in "Alice Doesn't Live Here Anymore", Diahann Carroll in "Claudine", Faye Dunaway in "Chinatown", Valerie Perrine in "Lenny", Gena Rowlands in "A Woman Under the Influence"
ROBERT DE NIRO in "The Godfather, Part II", Fred Astaire in "The Towering Inferno", Jeff Bridges in "Thunderbolt and Lightfoot", Michael V. Gazzo in "The Godfather, Part II", Lee Strasberg in "The Godfather, Part II"
INGRID BERGMAN in "Murder on the Orient Express", Valentina Cortese in "Day for Night", Madeline Kahn in "Blazing Saddles", Diane Ladd in "Alice Doesn't Live Here Anymore", Talia Shire in "The Godfather, Part II"
FRANCIS FORD COPPOLA for "The Godfather, Part II", John Cassavetes for "A Woman Under the Influence", Bob Fosse for "Lenny", Roman Polanski for "Chinatown", Francois Truffaut for "Day for Night"
The Best Picture victor, The Godfather, Part II, shifted back and forth over six decades in time to retrace the story of the same Corleone family and how it was founded. Simultaneously, it documented the rise to power of young Vito Corleone (Robert De Niro) and the family's decline a generation later through the aging son (Michael Corleone). 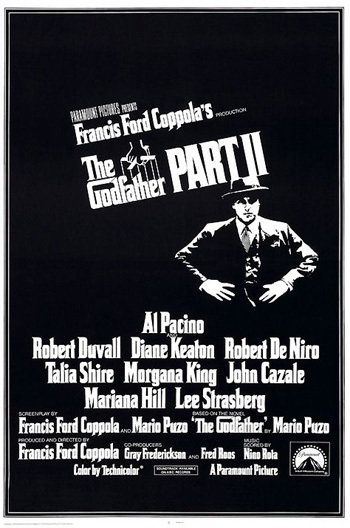 It also accomplished a marvelous feat - it did exceptionally well with double the total number of Oscars than its predecessor - with eleven nominations and six wins (Best Picture, Best Director, Best Supporting Actor (Robert DeNiro), Best Screenplay Adaptation, Best Art Direction/Set Decoration, and Best Original Dramatic Score (by Nino Rota and the director's own father Carmine Coppola)). It duplicated its predecessor's feat of three nominations for Best Supporting Actor (for Lee Strasberg, Michael V. Gazzo, and winner DeNiro). Five of its six un-rewarded nominations were for acting roles. For the first time since 1951, when individual producers rather than companies were cited in the Best Picture nominations, both producers Francis Ford Coppola (and Fred Roos) were honored by receiving two Best Picture nominations in the same year, for Coppola's The Conversation (1974) and for their shared winner: The Godfather (1972). This occurred for the second time in 2010. Legendary screen actor/dancer Fred Astaire was a sentimental favorite for his sole career Oscar nomination (almost an insult) - for his supporting role as a con artist and widower Harlee Claiborne in The Towering Inferno - he was the only star in the cast who received a nomination - with a non-dancing role! The final nominee in the Best Supporting Actor category was Jeff Bridges (with his second nomination) as drifter Lightfoot who helps ex-thief Thunderbolt (Clint Eastwood) and then plans a government vault heist in Michael Cimino's debut caper film Thunderbolt and Lightfoot (the film's sole nomination). Versatile director Howard Hawks received an Honorary Award/Oscar - he was recognized as "a master American filmmaker whose creative efforts hold a distinguished place in world cinema." Some of his most important films include Scarface (1932), Twentieth Century (1934), Bringing Up Baby (1938), His Girl Friday (1940), To Have and Have Not (1944), The Big Sleep (1946), Gentlemen Prefer Blondes (1953), and Rio Bravo (1959). In his entire career, he received only one (unsuccessful) nomination as Best Director - for Best Actor-winning Sergeant York (1941). In addition, French film-maker Jean Renoir received an Honorary Award - he was honored as "a genius who, with grace, responsibility and enviable devotion through silent film, sound film, feature, documentary and television, has won the world's admiration." His greatest films included Bondu Saved From Drowning (1932), Grand Illusion (1937, Fr.) (nominated for Best Picture in 1938), The Rules of the Game (1939, Fr. ), and The Southerner (1945) - with his sole Best Director nomination throughout his career. Gordon Willis' remarkable cinematography in both Godfather films was not nominated. 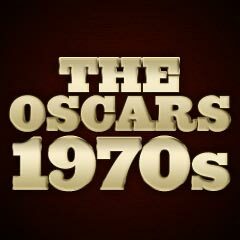 And the Best Picture nomination for The Towering Inferno displaced such excellent films in the category as Young Frankenstein, A Woman Under the Influence, Alice Doesn't Live Here Anymore, and Day For Night. Richard Lester's brilliant swashbuckler The Three Musketeers received no nominations, including an impressive performance by Charlton Heston as evil Cardinal Richelieu and others (Oliver Reed (Athos), Richard Chamberlain (Aramis), and Frank Finley (Porthos) as the three musketeers). Liv Ullman's searing performance as Marianne in Ingmar Bergman's Scenes from a Marriage would have been nominated and had a good chance of winning Best Actress, but the film was declared ineligible because it had been shown in a six-part, 5-hour version on Swedish television prior to its theatrical release in a shortened version. Director Joseph Sargent's crime thriller The Taking of Pelham One Two Three, about a New York subway car hijacking by terrorists (led by Mr. Blue (Robert Shaw)) who were challenged by the Transit Authority's chief of security Lieutenant Zachary Garber (Walter Matthau), was completely snubbed by the Academy. Director Alan J. Pakula's excellent political thriller The Parallax View (with Warren Beatty as newspaper reporter Joseph Frady) was un-nominated in all categories, as was Robert Altman's 1930s-style crime film Thieves Like Us (with Keith Carradine as Bowie and Shelley Duvall as Keechie). Martin Scorsese's film Alice Doesn't Live Here Anymore was overlooked in the Best Director and Best Picture categories. Goldie Hawn was overlooked as Lou Jean Poplin in director Steven Spielberg's The Sugarland Express, a cross-country adventure film of a desperate couple's flight - it was Spielberg's first feature film. And Richard Dreyfuss was neglected in one of his earliest performances as aspiring Jew Duddy in The Apprenticeship of Duddy Kravitz. Eddie Albert was bypassed for his role as Florida prison Warden Hazen in The Longest Yard. Gene Wilder (and other unrecognized cast members, such as Madeline Kahn, Teri Garr, Marty Feldman, Cloris Leachman and Kenneth Mars) was un-nominated as mad scientist Victor Frankenstein in Mel Brooks' Young Frankenstein (with only two unsuccessful nominations, for Best Adapted Screenplay (co-nominees Wilder and director Mel Brooks) and Best Sound). Recognition was sorely lacking for the film's set decoration (of Frankenstein's 1931 castle), its B/W Cinematography, and its Director. Blazing Saddles (with only three unsuccessful nominations, for Best Film Editing, Best Song, and Best Supporting Actress-Madeline Kahn), another Brooks' film in the same year, also lacked a nomination for Gene Wilder, and for Cleavon Little, as well as recognition for its director.